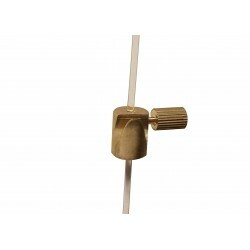 U Rail Ceiling System Ideal For Suspended Ceiling or Wooden Ceiling. Profile size is 14 X 6 MM. Comes in White Silver and Black colors. Custom colors are available at extra cost. This Ceiling mounted system is designed to screw in to the wood. As rail is tiny in the sizes that's why you cannot use longer screws with plugs. Weight capacity 15 KG per meter if you screw in to wood or thick MDF. Used vastly in modern London art galleries with suspended ceilings. 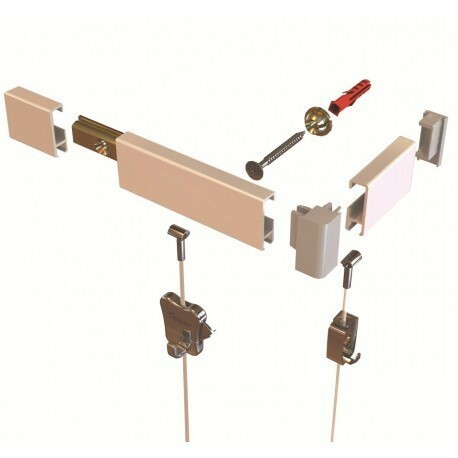 With this system you can use Nylon clear perlon or steel picture hanging cables. U Rail System There are 37 products. 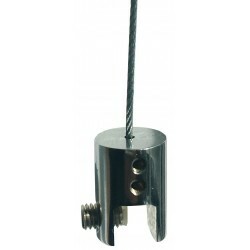 Cylinder Hook Brass 10 KG Work with Perlon (Clear Nylon Cable) & Steel wire rope cable up to 2MM thick. Speciality keep picture very close to wall ideal to hang framed flush against the wall. 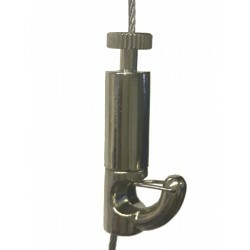 Self-locking hook Chrome 12.5 KG Work with Perlon (Clear Nylon Cable) & Steel wire rope cable up to 2MM thick. Hook size 30MM TALL & 23MM sticking out from wall. 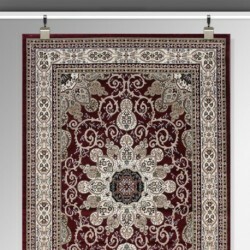 Speciality work with frames with grove at the back or banners with eyelet. 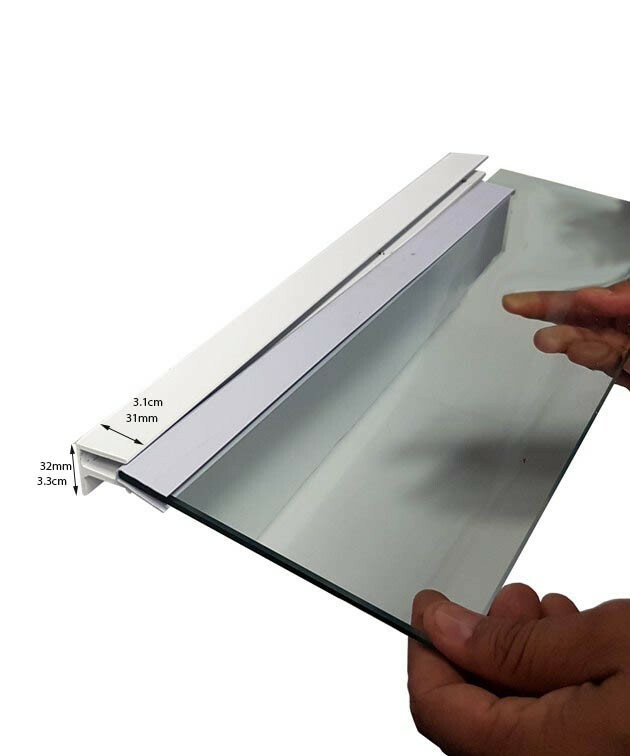 Hanging Aluminium Paper Rail Kit Comes with 3 Meter Long Steel cable which can be cut to size. 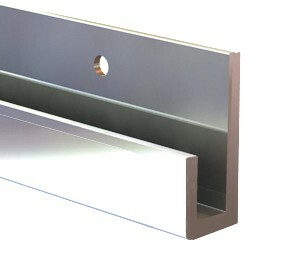 Rail profile Size 50X21 MM Comes in White, Silver & black colours. 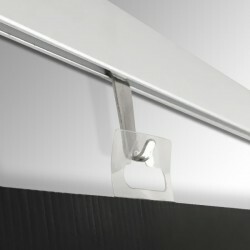 Panel clamp to hang acrylic, glass, foam board, corex board, MDF board up to 8MM thick. 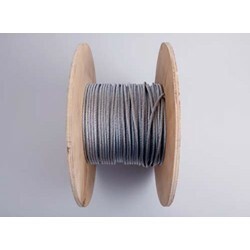 Work with up to 2mm thick steel wire rope cable. 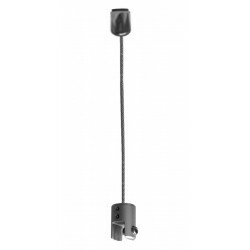 Heavy Duty Self Locking Captain Hook 30kg Security Edition Tested with 30 KG weight picture with 2 cable& 2 hooks. Applied one cable on left & one on right of the picture frame (Work with steel cable & Perlon Nylon Cable). 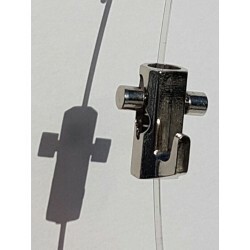 Self Locking Cable Hook 20kg Security Tested with 20 KG weight picture with 2 steel cables & 2 hooks, applied one on left & one on right of the picture frame. 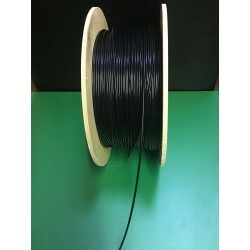 Work with both steel cable & Perlon nylon clear cable. 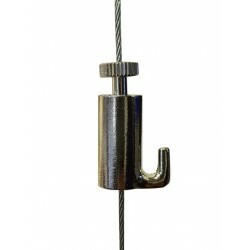 Picture hanging steel wire rope cable tested with 50 KG, can hold up to 100 KG with two drops. 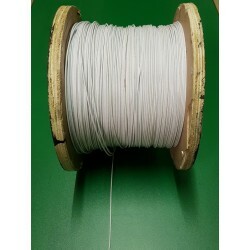 Stock Sizes 1.5MM, 2MM, 3MM, 4MM also available white & black cables in 2mm thickness For details please CALL. 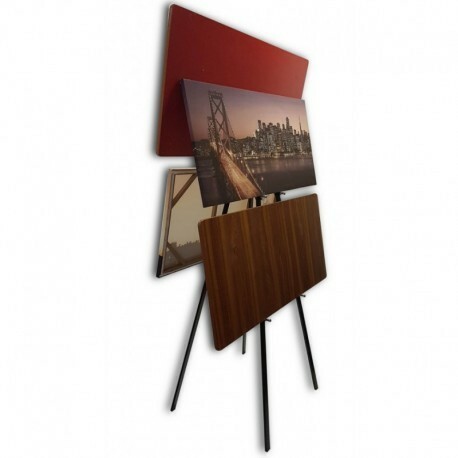 Perfect Solution to hang pictures directly from cliprail. Very Practical you can add & remove from any point of clip rail. Can be used with or without cables. You can hang up to 15 KG picture by using 2 of these.